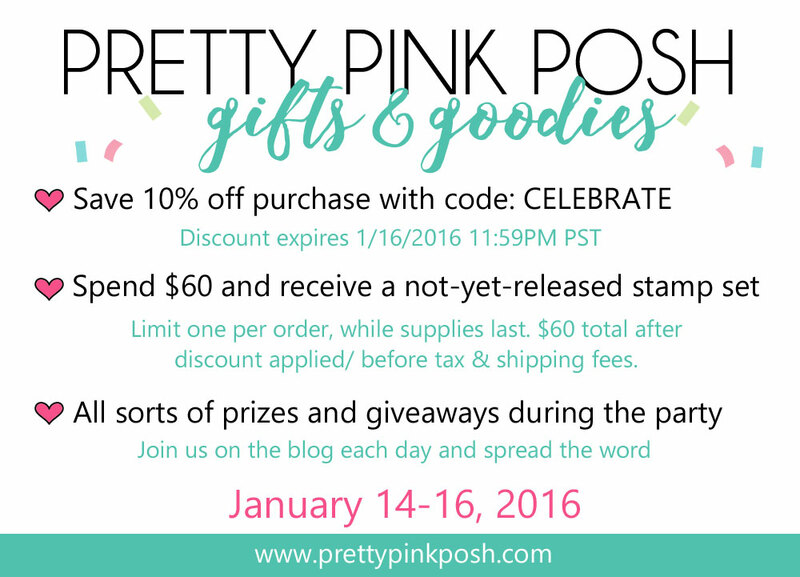 Mama Mo Stamps: Pretty Pink Posh Turns 2!! These are SO lovely! Thanks for the inspiration! Very pretty cards. I love all the cool detail on the first one! These two cards are just beautiful. Gorgeous cards! I love the cardinal. What a great way to use the sequins! It sure pops! Absolutely beautiful cards. The redbird is my favorite and I love how you used the sequins on the branches. Love the PPP berries on your branches!! So creative. Beautiful cards. Stay blessed. Great projects. Love the bird card. Very sweet cards! I love the stenciling behind the flower. Great cards! Thank you for sharing these beautiful cards. Love the cardinal. So pretty. Both the cards are wonderful. Thank you. Both cards are beautiful, thanks for sharing. Such elegant cards, love the simplicity, yet so beautiful!!! I love, love, love your cards. I am just getting into stenciling and can wait to try this. I love the coloring of the cardinal in your second card. Beautiful, rich colors, especially with that vivid cardinal! Very pretty! Wonderful cards! Love the striking depth and dimension achieved in the bird! Beautiful cards, love them both. Love the design of the first. And your cardinal card may be "simple" but it's a stunner. WOW! Mind blown! Your first card is cute but the second card has my heart going BOOM! BOOM! BOOM! LOVE that cardinal and the use of the sequins is divine!! Absolutely delicious card!! TFS! The cardinal card is so beautiful!! Oh, your little red cardinal was just singing to my heart! Both cards are great, especially liked the stenciled background on the first and the sequin 'berries' on the branches in the second. Thanks for the inspiration. I see you used some stenciling in your first card. Hope it's going to be put up on the Stamp Nation sight. ;) Beautiful clean and simple the next card. Love that twine die just for the same reason you do. Good for flat mailing. :) You do wonderful work Mo! You say simple.. I say exquisite.. Your first card is awesome! Love the fade out look. Your second card is beautiful. Love the deep read of the bird and the simplicity of it. Thanks for reminding me to use stencils in the background! These cards using PPP dies are fabulous. I love the scalloped frame. The first card is very sweet and pretty. The second is totally elegant and classy! i like them both. great ideas for card sets to give as presents too. I love the use of the sequins on the branches. Very lovely. Pretty card ideas! I love the red sequins on the branches. Love the simple, elegant inked background. Such pretty cards! The first one is my favorite! The faded checkered background turned out so nice. I also love the coloring on the cardinal too. Beautiful Cards... Thanks for sharing..
Love that bird card, Maureen! I love your softly stenciled background. Wonderful! love your cards, thank you for sharing. I think the cardinal card is very clean..i dont think it's simplistic at all..very elegant looking!! Your cards are stunning!!! I love how the first card fades out in toward the flower....How did you do that? How did you create a card that looks white on the outside edges but then coming in toward the flower and it has color? Thats an awesome technique! And your second card is just gorgeous! Love that bird! TFS! Elegant card. One I would be honored to receive. The layers of techniques are fantastic on both cards! The one with the cardinal is striking and classy - well done! You have a wonderful knack at stopping at just enough/perfect point of the card :) I am still practicing embellishment moderation! OH! i love the stencil, so elegantly done. an that cardinal is perfect. inspired. The cardinal card is simple and elegant. The sequins add just the right touch of bling! What lovely cards! Wow, the cardinal is amazing -- it really makes for a very striking card! I love the checkered background you used on the first card and how it fades out! Your cardinal card stopped me in my tracks! The lines are so clean and crisp and the colors *PoP*! Love your cards and use of dies. Very pretty cards. The cardinal card is striking. great cards! i love all the subtle touches on that first one! Gorgeous! Love all the wonderful colors! Beautiful cards. Terrific use of the PPP sequins. Beautiful and sweet cards Maureen! Beautiful cards, Maureen--your CAS style is very inspiring to me! These are great cards. Love the background of the first one. Beautiful cards! You're so inspirational! Stunning cards!! I love the cardinal card especially - so beautiful!!! My favorite is the flower card....so cute. Great cards! Thanks so much for sharing. I so love any doodly flowers, and yours is well done! The red on the second card is absolutely stunning. Love the red sequins and the cardinal is just beautiful. Thanks so much. Cute cards! The one with the cardinal is my favorite! That is such a great idea to use sequins as the berries on the branches! Great cards. The second one is stunning. These are incredible! Love your unique use of the sequins! yours are simple but elegant I love the look. Fantastic cards Maureen. I love that pretty bow too.Great work! Love your cards, am really drawn to the flooded flower and those colors-fabulous!!! Love both your cards, but that first one is absolutely gorgeous!!! The background, the borders, all of it!!! Thank you!! These are stunning cards! Love them! beautiful cards and great techniques used. love the boarder dies!! I love both of the cards! The flower is so cute! The bird is stunning! Two really great card designs! The beautiful day has the softer hues in the flower and background while the second card has a very bold feel with rich red and black used! I like them both! Gorgeous cards! The cardinal reminds me of my sweet grandmother. She loved cardinals! Beautiful cards! I love the layering, colors and clean look. Thanks for sharing. Like both but the second one is really amazing. Thanks for sharing. Maureen, I love both cards. PPP frames are great. Less is/ more and I love clean and simple. Beautiful cards!! Love the cardinal!! Your card are very pretty. I really like how you used the sequins on the bird card. Very clever. Love love love the cardinal on the banner. The faded stencil background adds a great look without adding additional bulk to the card. Gorgeous cards!! Those are such versatile dies! Two beautiful projects! I love the pop of black on both cards. Great use of the red sequins as berries. They add wonderful shine. The bow die is fabulous too, just the perfect size! Love both of your cards! Using a little black paper to accent the bottom of the cards really sets them off. Love how you used the sequins on the tree branch! Love how you did the background! Cute card! Love both!! The cardinal is so pretty!! What beautiful cards - I love the scalloped frame die .... can't wait to place an order. I love the stenciled background! Both incredible cards! Love the way you embellished your cards with a little sequin! Great cards. Love the checker board stenciled background-so eye catching. I love your cards! I love in the first one the nicely sponged background, the cute pretty flower, and the dainty water droplets! I love in the second one how you used sequence for bright red berries! Beautiful cards Maureen...brilliant creations, especially like the second card. Thank you so much. Love the simplicity of your cards, in particular like the first card with the stenciled water colored background and the bold flower in front of it. So cute ...love the cardinal and of course the sequins!!! Beautiful! Beautiful! They are both so pretty, but honestly, that second card with the cardinal made me do a double-take. It us absolutely stunning!! Beautiful projects! The bird is super! Two beautiful cards! I love your clean style and layouts. You really made beautiful cards, love them both. Beautiful cards! I love the scallop frame! Your cards are gorgeous (as always). Wonderful cards! Love the sequins on the branches and the bow. Love your creations using the dies! Beautiful! Your cards are gorgeous. Thanks for sharing. That cardinal is gorgeous! I love the red berry sequins! Love your cards. Both of them stand out! Awesome job. I love how you did the background stamp. Thanks for sharing. Terrific pair of cards! Love that checkered background! 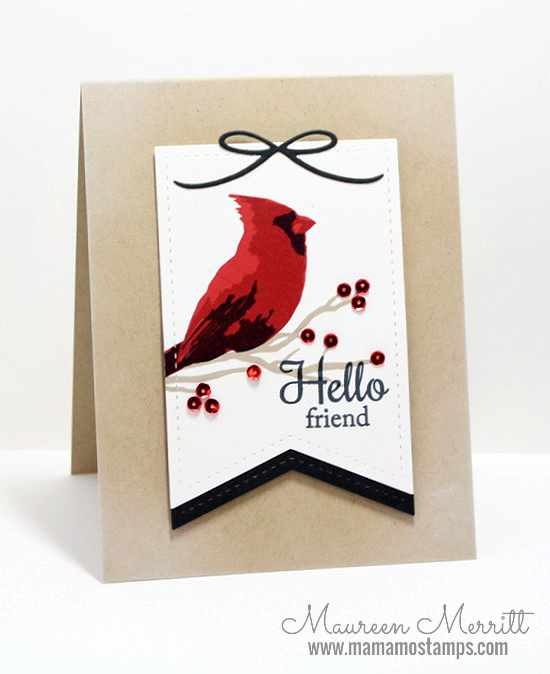 I really like the simplicity of the black bow die on your card with the bird on it. These are lovely. That second card is so striking, LOVE the cardinal! I just love the card with the bird on it, beautiful! Wow, beautiful cards. I really like the flower card A LOT. Thank you. Awesome awesome. I love the second card. The first card is so charming. Thanks for sharing your talent. Beautiful creations. Love your work! Love how the checks fade into the background on the first card. Love the cardinal card, it's so striking! I especially love the scallop frame on your pink flower card with the fading stenciling. So pretty. The flower one is so "soft" and subtle, but the cardinal one stands out, asa cardinal should. Both beautiful. Fun and Stunning cards! 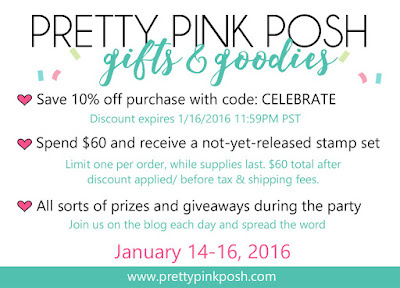 Love the PPP dies and that gorgeous bird stamp. Thanks, Paulette S.